donor journey | What Gives??? Before I say anything else: Happy Birthday to my girlfriend Kate! Now — onto the post! I’ll say it again: you’ve probably noticed me writing and tweeting and talking about #DonorLove a lot lately. As I described in this post, my definition of donor love is this: a lens us fundraisers need to look through to ensure our donors are at the heart of what we do. In that same post, I also mentioned that donor love is a lot about stewardship, but that’s not all it is. We can show donor love at every stage of the donor journey. We can be loving in our identification of donors… does this person just have a lot of wealth, or are there clues that they could be inspired by our charity’s work? We can be loving in our cultivation of donors… are we barging into their home with an agenda, or are we asking pointed questions and listening to find out what inspires their philanthropy? We can be loving in our solicitation of donors… are we telling them what we want, or aligning their passions with our needs, based on the conversations we’ve had about what they want to impact? And, of course, we can be loving in our stewardship. You know where else in the donor journey we can show donor love? When it ends. I’m not talking about when the donor stops giving (God forbid!). I’m talking about when you – the fundraiser – leaves the organization. Again – God forbid! – but it happens. In fact, as you know, it happened to me just recently. I left my fabulous post at Wilfrid Laurier University for a new gig, and in preparation for transitioning out of that role, I thought about my donors. I imagined them receiving a bounceback email from Laurier when they are checking in about their annual gift, saying “this email address no longer exists”. I don’t know about you, but I was horrified at the thought of this! I spent so much time building relationships with my donors, strengthening their connection to the university. It could all be for nothing if this happened. It’s not about me. It’s not about me being a great fundraiser and the only reason my donors give to the organization, because that’s not true, and it’s not what it’s about. But I’m a representative of the cause, and if either of us – me or the cause – disappoint the donor, we have to start from square one. I didn’t want that to be the legacy I left behind. So I sat down with my donor list and put a star next to the name of every donor who I’d made a meaningful connection with, who had unfinished business with the university regarding donations (i.e. was thinking over an area of support, had an upcoming pledge to fulfill, etc. )… that sort of thing. These were the people I needed to inform of my departure. But it wasn’t an announcement; it was a touchpoint. It was a chance to thank the donor, show them how much they mean to the organization, and ensure a smooth hand-off to my successor. Again, it wasn’t about me; it was about the donor, and it was about #donorlove. So there you have it! You can even leave with love. 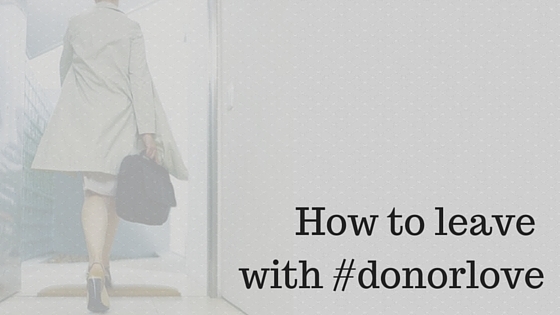 Do you want to know what my #DonorLove Goodbye Note looked like? Sign up for my email list by the end of September and I’ll send you the #DonorLove Goodbye Note template!